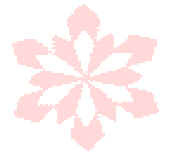 For each snowflake that does fall, a blessing I will recall. Each flake that falls today, I will see in a brand new way. I'll praise God for family and friends, who have helped my life to mend. This one falling from the sky, I thank God for apple pie. That one is like my brother, which like him, there is no other, and there is my mother. There goes my childhood pals, with each one so special of guys and gals. That special one is my son, and the one all atwirl, is my little girl. For each snowflake that falls today, I will see in a brand new way. Those represent Jesus blood, which though one drop started, became a flood. There have been so many blessings in my life, but I've often thought too much on strife. This one landed on me, and was made especially for my life; so I give thanks for my wife. There is the moon and the stars so bright, and to thank God for these, seems more than right. One represents hurt and tears, that I've shared with many through the years. Now on the ground a snowy white, seems now complete, reflecting this heavenly light. Thank You Lord for each snowflake You've given me, and allowing each my blessings to see. So now when I begin to feel cold and low, and joy I seem not to know, Lord send me blessings in flakes of snow.